It depicts the Adoration of the Magi. Holy Trinity church > Link is situated in the grounds of Great Hockham Hall, hidden behind tall trees. The church does not have a tower and is hence not easily spotted. The building dates mainly from the 13th and 14th centuries. 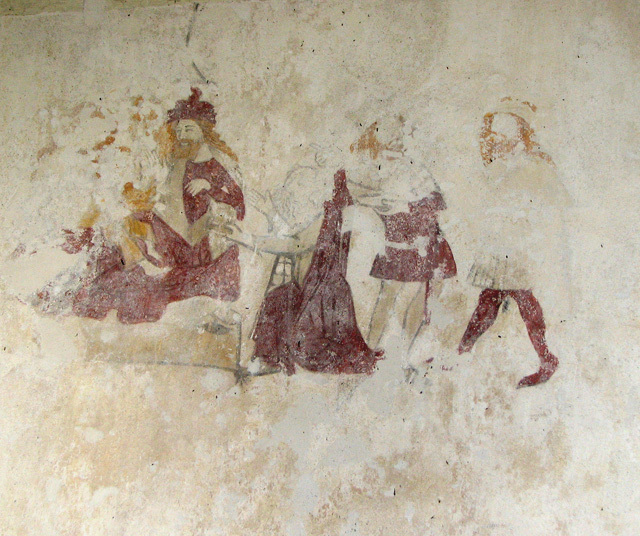 It houses three medieval wallpaintings: the Holy Trinity painted above the chancel arch > Link has been dated to the 1450s; the Adoration of the Magi and another, unidentified painting > Link on the north wall are believed to be a century earlier. The church also has a remarkable set of 16th century benches with some rather eccentric, carved poppy heads > Link - Link - one of these a mermaid > Link holding a comb and a mirror. The baptismal font > Link dates from the 14th century.